The march of Imam Ali Al-Hadi (peace be upon him) in humanitarian course was and is still the focus of a major educational institutions in the world, including our university, which inspired more thought and sermons from him, this is what the Minister of Higher Education and Scientific Research Dr. Hussain al-Shahristani has started his speech with in our University with its Fifty-eighth anniversary of the founding of the mother of Iraqi and Arab universities , the University of Baghdad, which has given Iraq and the world with the best scientific competent from presidents of Republics and universities, writers, thinkers and senior heroes . Prof. Dr. Hussain Al-Shahristani, Minister of Higher Education and Scientific Research has attended and sponsored the annual celebration of the Day of Baghdad University nat the central hall of the University in Al-Jadirriya , seniors of our university scholars and some members of parliament and political leaders have attended the ceremony which has included a large amount of characteristic events and activities that expressed the weight of the University of Baghdad with its great possibilities, a celebration has also included the inauguration of many exhibitions for all colleges and institutes and centers of the University, such as the inauguration of rehabilitation and employment center, and big sports events competitions with music and plastic arts activities. The celebration has began with a blessed recitation of a verse from the Glorious Quran, then the attendance have read Surat Al-Fatiha( the opening ) in memory of the souls of our heroic martyrs of the armed and security forces and popular crowd, and then the national anthem has played by the coral of the College of Fine Arts and led by maestro Dr. Mustafa Al-Sudanni to mark the beginning of the celebratory festival. His Excellency has stressed that sermons and lessons of Imam Al-Hadi (peace be upon him) and his humanitarian role in shaping the Islamic Muhammadiyah image , which published justice and thought of the world, where the Minister has said,” this day of the anniversary of the founding of the University of Baghdad that provided further tender for Iraq and the world, the day of the university coincides with the memory of the martyrdom of Imam Muhammad bin Ali al-Hadi, “peace be upon him” , the symbol of Autism ,truth and justice, he was dear among his family and his companions in Islam .He fought injustice until he was awarded the honor of martyrdom, to be buried in Samarra. Accordingly , we can say that the enemies of yesterday are just as dangerous and evil as the enemies of today. 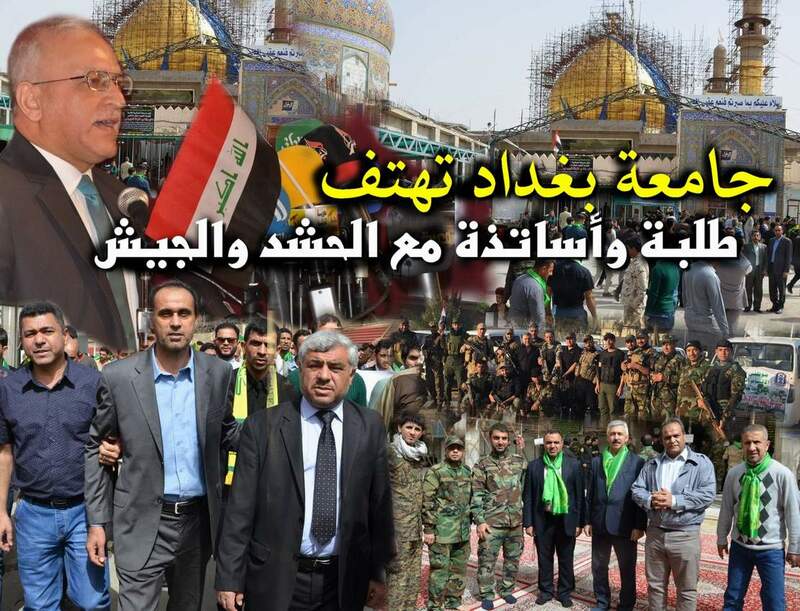 Iraq witnesses a brutal struggle with the enemies who represents injustice and disbelief at the same time .He stressed on the need to unite and stand side by side with our military and the popular crowd on the battlefield, and that our commitment to the study and education and then raise the scientific, intellectual and cultural superiority represents a defeat of the enemies of Iraq and the humanitarian those who are Tikfiri (those who accuses another Muslim of apostasy) and obscurantists of ISIS. His Excellency also has explained in his speech the leading role of the University of Baghdad through science and virtue, which he sees they must win , stressing that our university is the Iraqis University as a whole , and we are proud that among “OPEC “ there were four ministers who were graduates of the University of Baghdad. He also has explained the importance our university’s communication with the major institutions and the labor market. From here, the University is responsible for the development of plans for the definition of institutions, factories, companies and the labor market as a whole with the necessary competencies or capacities. His Excellency has concluded his speech by thanking all those in charge of the occasion . 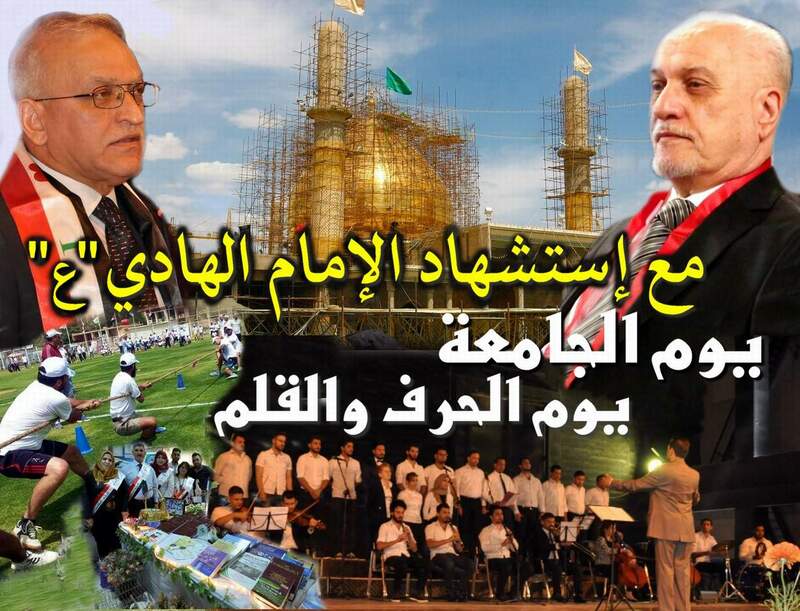 President of Baghdad University professor Dr. Alaa’ AbdulHussain in his speech, recalled the exploits and the lessons of the martyrdom of Imam Hadi (peace be upon him) adding that the university has come in advance of more than 23,500 Universities in the classification of webomatrex and its entering of Guinness World Records . 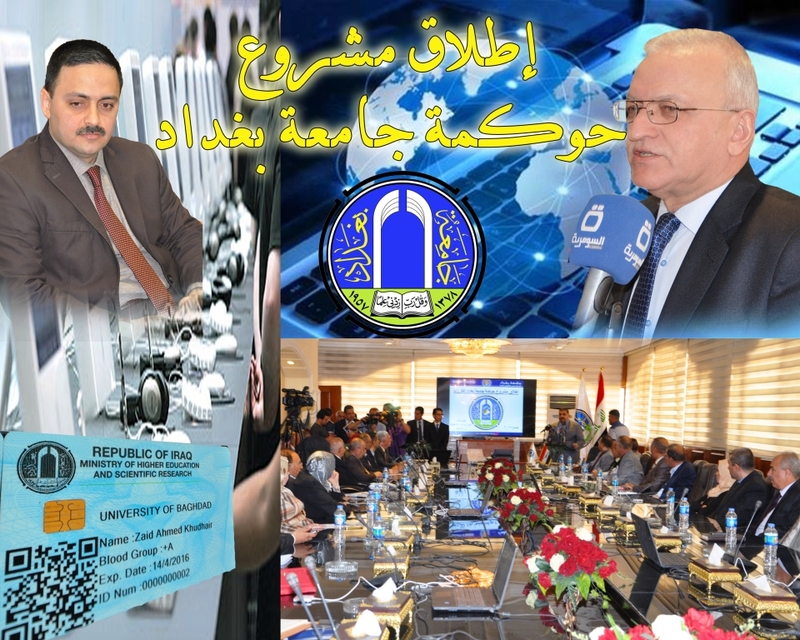 The university has achieved global achievements at the level of distinctive research that are published in the highest international magazines, as well as characteristic patents of the University, he has also explained that the university has completed an electronic revolution through the launch of e-governance, which is the first of its kind in Iraq. Furthermore , the university has focused on these aspects to train students in the applied aspects , especially since the university has opened training centers including the German Knauf Foundation Center for dry building, and the University has planned a rosy picture through the adoption of technological incubators that accomplish a series of gains in work. The choral of college of Fine Arts, led by maestro Dr. Mustafa Al-Sudani has presented musical lyrical pieces in patriotism, and the college of Physical Education has presented a great festival at the University Day and in coordination with the Department of Sports and artistic activity at the university, the celebration also has included various exhibitions for all formations of the University, as well as the Fine exhibitions and flowers and apiaries handicraft galleries . Many media institutions and satellite channels has covered the occasion to represent the great importance of the reality of the country. A lot of students has expressed their happiness and love of science and knowledge .The website team and office of Al-Jami’ya channel at the university has accompanied the event and documented it with a series of scenes and photographs. Within the multiple activities and achievements carried out by the faculty members of University of Baghdad through openness to the outside world in addition to participating in the global workshops and seminars in line with the objectives of the University of Baghdad and its global progress in international rankings. The accomplishment of the University of Baghdad this time has come from launching the project of university e-governance in all its affiliated colleges so that it can serve the faculty, staff and students administratively and financially through an electronic system that can save time and effort and to facilitate the work with high accuracy. The president of Baghdad University professor Dr. Alaa’ AbdulHussein AbdulRasul has stated during his speech in the presence of the advisor of Minister of Higher Education and Scientific Research, Prof. Dr. Mohsen Al-Furaiji and General Director of the Department of Studies and Planning and Follow-up ,Dr. Suhail Najim Abdullah as well as the deans of the colleges of the University of Baghdad ,that “the university e-governance project has included four stages and today we have started the first phase to be correct and fruitful beginning with the service of cadres of university in general noting that this project was launched by University self efforts , as the need for this project is necessary as a result of the development in countries around the world that have preceded us in this area and we have supported this project because of its finite accuracy in giving and saving information that save time and effort in all administrative transactions. While the Assistant of president of university for Academic Affairs, Assistant Professor Dr. Osama Fadhel AbdulLatif has stressed that the university e-governance is a project that is applied for the first time in Iraq for the management of staff, students and faculty members electronically and that the first phase of this project has began after the completion of the database center in addition to the servers and towers that will connect the University and its formations in general so that all associated colleges with the university will get this service.Assistant instructor Samir Mohammed Jaber ,Director of Studies and Planning Department at the University of Baghdad has mentioned that University e-Governance Project consists of four stages, the first stage is to collect raw data through electronic gates specially prepared using a mechanism (QR-code) where is one of the best and most secure way to recruit data; the second phase is aimed at collecting fundamental data and the issuance of the common statistical figure as well as the issuance of smart card that contains the three electronic methods for data verification which (QR-Code RFID, SIM) by the latest technology used globally ; the third phase includes the launch of Smart Systems and based on the basic data of the previous stage that working to address all the scientific, administrative and technical procedures electronically automatically, using the principle of artificial intelligence in the data processing and the fourth and final stage is to achieve the principle of e-governance and launching the electronic queries for all users of the system.